Let’s look at the apostrophe’s main uses, shall we? They’re used to create contractions. Think of them as the blank tile in a Scrabble game (although you can’t use blanks in this way in Scrabble, unfortunately). They are equals They—blank tile to substitute for the “a”—re. They‘re. They’re used to create possessives. Think of them as a claw (or talon!) pulling some possession toward the owner. Owl‘s dinner. Note that there are several variations on this. If you were talking about a gathering of owls for a meal, you’d create the plural first, then add the apostrophe afterward, to show that the entire group possessed the dinner. The owls‘ dinner. If the word is a plural, but doesn’t end in s, use the regular apostrophe-s rule. The women‘s conference. If you are talking about something that belongs to two people, for example, Beth and Eliza, you only put the apostrophe-s on the second one. It was Beth and Eliza‘s house. BUT if the two people possess one whatever-it-is each, then you use an apostrophe with both names (and make the whatever-it-is plural). We went to Beth‘s and Eliza‘s houses. They are generally NOT to be used in plurals, no matter how many times you may see them used this way on signs and practically everywhere else. A sign that says “Cookie’s On Sale Today” always makes me ask, “Cookie’s what?” because Cookie’s is a possessive, not a plural. People often get into a quandary over its and it‘s. This use of the apostrophe is in a class all its own. See what I did there? In that case, “it” was a possessive, but I didn’t use an apostrophe. That’s because in this case, it‘s with an apostrophe is the contraction for it is, so it can’t also be the possessive. The possessive is written simply as its. That’s one that just has to be memorized. I want to say just a word about Word – Microsoft Word, that is. If your font has curved single quotation marks and double quotation marks, then when you use a single quotation mark as an apostrophe to truncate a word such as ’twas, the apostrophe will face the wrong way. (Some other programs likely do this, too, while others switch the apostrophe around, right before your eyes, when they realize what you’re doing.) The way to get around this when using Word is to switch to straight quotation marks. The problem is then alleviated because the marks don’t curve one way or the other. NOTE: This post is meant as a general overview, not an exhaustive list. If there are other uses of apostrophes that perplex you, or that you’d like mentioned, please tell Owl and me about them in the comments. 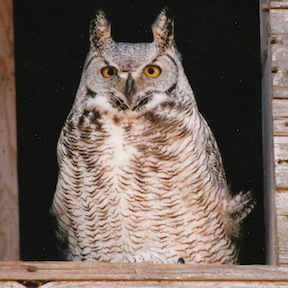 As always, if you want to ask a grammar or word-choice question for the Grammar Owl and me to answer, you can ask it in the comments or send an email to mail (at) flubs2fixes (dot) com Our talons are gripping the edges of our barn windows in anticipation! So we must be extra meticulous!